The Islamic militant group Hamas has used a female bomber for the first time in a suicide attack which killed four Israelis on the border with Gaza. Hamas vowed to intensify attacks against Israel following the bombing at the main Erez crossing. 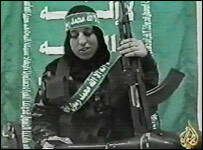 Militants identified the bomber as Hamas member Reem Raiyshi, a mother-of-two in her early 20s, from Gaza. Israel condemned the bombing and warned it might tighten restrictions against Palestinians. At least two Palestinians were among seven people injured in the blast. Hamas and the al-Aqsa Martyrs' Brigades, which is linked to Palestinian leader Yasser Arafat's Fatah faction, said the attack in Erez was a joint operation. The BBC's Middle East correspondent, James Reynolds, says this shows that despite wide-ranging political differences and rivalries between Hamas and Fatah, there is strong co-operation in the field among the different armed factions. Hamas said it sent a woman because of growing Israeli security "obstacles" facing its male bombers. "For the first time [Hamas] used a female fighter and not a male fighter and that was a new development in resistance against the enemy," Hamas founder Sheikh Ahmed Yassin said. "Resistance will escalate against this enemy [Israel] until they leave our land and homeland." The BBC's Middle East analyst Roger Hardy says it appears the Islamic movement is putting practical considerations ahead of ideological ones - they are hoping women may have a better chance than men of evading Israeli security precautions. The woman blew herself up inside a security office at about 1000 (0800 GMT) as Palestinians were going through security checks before entering a nearby industrial complex. Israeli officials said the bomber tricked soldiers by saying she had a metal implant in her leg which would trigger metal detectors. "Because she was a woman, a female soldier was sent for to search her. She used this opportunity to enter the building, a metre or two past the door, and blow up," said Israeli Brigadier-General Gadi Shamni, commander of Israeli forces in the Gaza Strip. Witnesses described chaotic scenes as the woman detonated explosives concealed in her vest. "Glass and black smoke flew everywhere," an unnamed Palestinian told Reuters. "Arabs were screaming, Jews were screaming, nobody knew what was going on." Israeli Foreign Ministry spokesman Jonathan Peled said the industrial estate where the attack happened was a good example of co-operation between Israelis and Palestinians. He suggested that the militants were harming their own people by targeting such places which offered employment. "They are not only attacking Israelis and blowing up human beings, they are also blowing up any kind of chance for peace and reconciliation between both sides," he told the BBC. Correspondents say there will be a lot of disappointment among Palestinians over the attack - there is high unemployment in the Gaza Strip and many are extremely glad of the high wages paid at the industrial estate. Another government spokesman, Avi Pazner, said Israel might tighten measures against Palestinians following the bombing. Erez is the main crossing point between Israel and the Gaza Strip, which is surrounded by an Israeli fence to stop suicide bombers entering Israel. The blast is the first suicide attack since 25 December, 2003, when four Israelis were killed and over 20 injured in a blast near the Israeli city of Tel Aviv. It came a day after a 29-year-old Jewish settler was killed by Palestinian militants in a drive-by shooting near the West Bank city of Ramallah. "Any suggestion that Hamas might be observing an unofficial truce has been dashed"